We explain what teachers mean when they talk about finding 'the difference between' and give examples of how children are taught to work out the answers to subtraction problems. 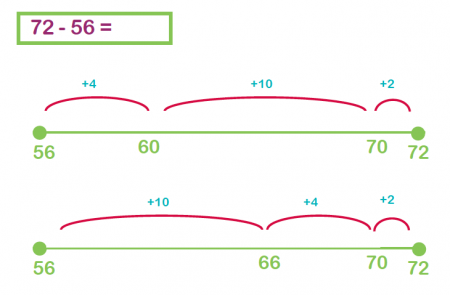 Children can be encouraged to use their fingers or a number line to work out the answer. If they used their fingers, they would need to have the 1 in their head, then count on their fingers to get to 6, holding up 5 fingers, which is their answer. It is very important that children become confident in finding the difference between two numbers (up to four digits) by the end of Year 4. 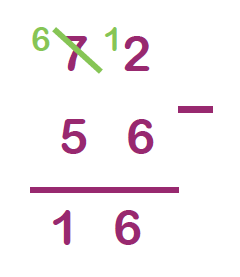 In Years 5 and 6 a lot of the emphasis is on multiplication, division, decimals, fractions and percentages, whereas addition and subtraction will not be practised as much. Therefore, children need to be confident in their mental and written subtraction before moving onto later Key Stage 2.